Heel pain is common but that doesn’t make it any less painful or less frustrating to live with. While the causes of heel pain can vary, the most popular culprit is a condition called plantar fasciitis (also referred to as heel pain and runner’s heel). There are many cases of misunderstood heel pain—either because a proper diagnosis hasn’t been sought or the incorrect information has been given out. With a myriad of myths circulating about heel pain, it’s essential to get the right advice. “Heel pain is commonly linked to a bruised heel; but in fact an over-stretching of the fibrous tissue in the foot causes plantar fasciitis. 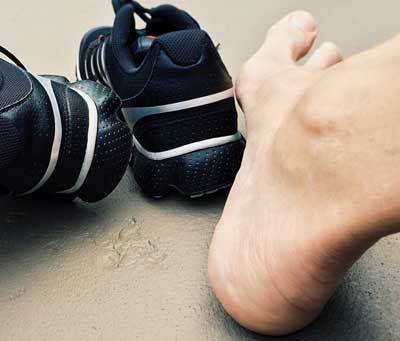 It can also be incorrectly diagnosed as heel spurs or achilles tendonitis,” says podiatrist and founder of A Step Ahead Foot + Ankle Care Dr Brenden Brown. Rather than seeking professional help, many people suffering from heel pain will ignore their condition—hoping rest and time will cure it. If left untreated plantar fasciitis can last years. Untreated plantar fasciitis can further aggravate the foot, resulting in increased swelling. It can also lead to other medical problems affecting the hips, back and knees. Going barefoot might seem like the natural thing to do but walking around without shoes puts additional strain on the plantar fascia—particularly first thing in the morning, when the muscles and tissues are tight. People commonly opt for a foam or silicone heel cushioning as a treatment for heel pain. Yes, this might provide some temporary comfort, but it won’t cure the condition. Hard, rigid orthotics are not only uncomfortable, they will do nothing for your foot pain. They might actually cause you more pain. Soft pliable orthotics are designed to support the foot while allowing the natural movement. However, orthotics alone won’t heel your feet pain. Talk to one of our podiatrist about the best orthotics and the different therapies that can help rehabilitate damaged tissue. Thongs, trendy trainers or even fancy footwear with special arches won’t cure heel pain. Yet choice of shoe is important. A shoe that has a firm shell and a small amount of structured cushioning works best. The shoe should NEVER bend in the middle. Before heading out to pick up a new pair of shoes, chat to one of our podiatrists to get the right advice—as well as a detailed solution that includes other treatment options. Cortisone injections can be painful and evidence suggests they don’t work. In fact, one study showed that 3 months after having a cortisone injection more than 55% of people had the same pain. Another study revealed that injections of saline and cortisone both gave exactly the same result! The first step towards treatment should be a proper diagnosis from a podiatrist. The best approach to heel pain should be a multi-pronged plan that might include orthotics, professional advice and therapy, such as shockwave treatment. To find out more about plantar fasciitis visit: heelpaindoctor.com.au or to obtain a diagnosis contact A Step Ahead Foot + Ankle Care today. Or head over to Coach Nine to hear what else Dr Brenden has to say about heel pain.